Why do 1.5 million children die each year from diarrhoeal disease? Because tiny particles of excreta get into their mouths. How? Because 150 years after ‘The Great Stink of London’ brought about a sanitation revolution, 2.6 billion people – 40% of the global population – do not have a decent place to ‘go’ and their bodily wastes are left lying about. Diarrhoeal diseases are not ‘water-related’, they are ‘s**t-related’. Until we call a spade a spade, this scandal will continue. 2008 is the International Year of Sanitation, and now is the time to speak out boldly and open up the excretory frontier. Join the speakers to insist that ways be found to overcome the silence which inhibits the access of millions of people from that basic necessity for public health and human dignity – a toilet. 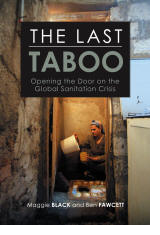 The Last Taboo: Opening the Door on the Global Sanitation Crisis, by Maggie Black and Ben Fawcett, brings this neglected topic out of the closet. This highly readable book is aimed at all readers interested in the causes and consequences of this global sanitation crisis. Discounted copies will be available at the event. Those who can’t make it to the event can purchase copies online.